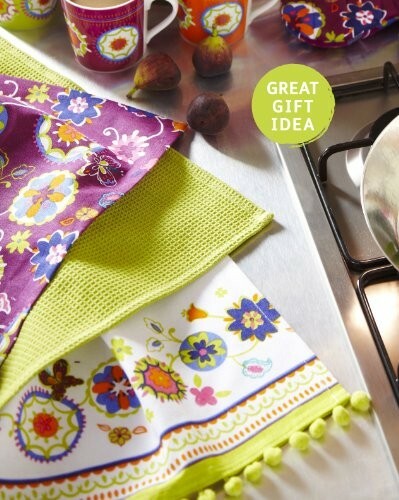 Wonderful Set of 3 retro tea towels from the Suzani range by Cooksmart. The set includes 1 x Tea towel in aubergine purple with Suzani print, 1 x green waffle and 1 x white with Suzani print and green pom pom trim. These would make a beautiful gift on their own or combined with other items from the Suzani range. Washing instructions: Wash before use. Wash as synthetics. Wash dark colours separately. Line dry or tumble dry on low. Many more items available in the Suzani Range of Kitchen Accessories.